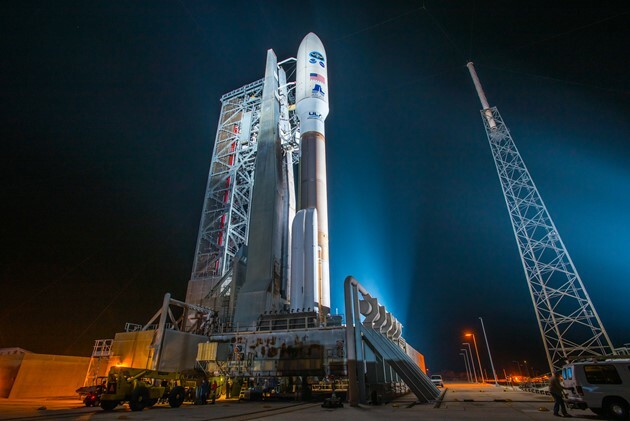 United Launch Alliance presented a new website to transform how launch services are selected and, for the first time in the company’s history, introduce a transparent pricing structure for the Atlas V launch vehicle. The new website, accessible under www.rocketbuilder.com, allows customers to shop for launch vehicles and provides insight into what services ULA can offer to customers with full transparency in the pricing department. 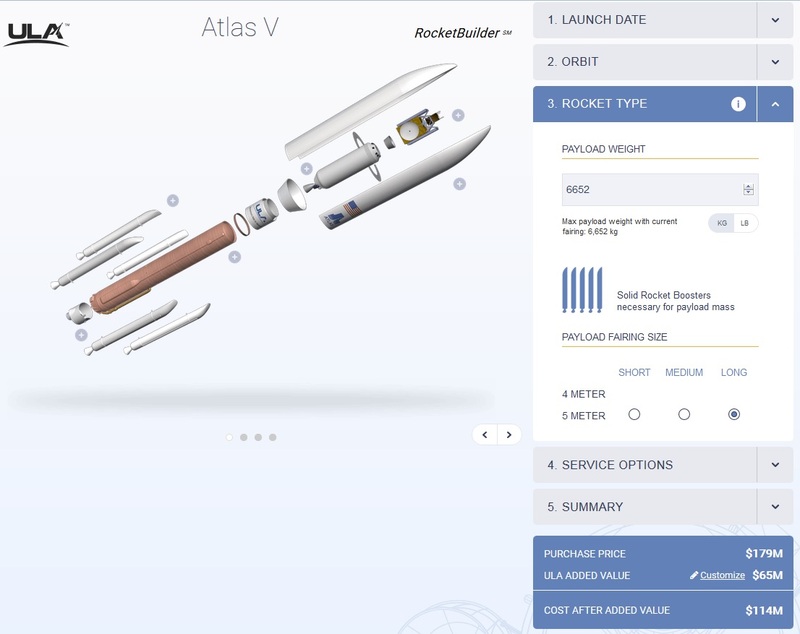 Freely accessible to the public, the website also allows rocket enthusiasts to explore the capabilities of ULA’s palette of Atlas V launch vehicles. The RocketBuilder website gives satellite builders and operators a new tool that can inform decisions during the spacecraft development phase and potentially help keep overall program costs down. 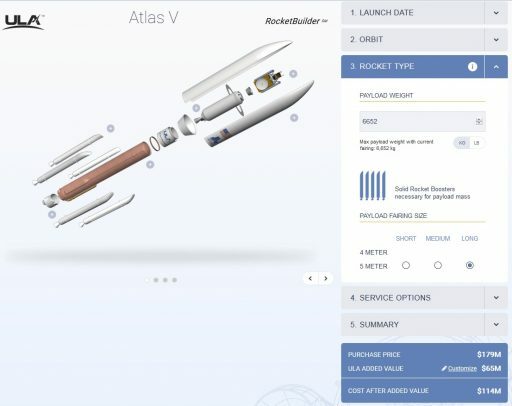 Customers can input their satellite’s specifications, target orbit, desired launch date and mission requirements to get an estimate of the total launch services cost when choosing Atlas V.
RocketBuilder was unveiled on Wednesday by United Launch Alliance CEO Tory Bruno to ring in a new era of launch vehicle procurement and market transparency. 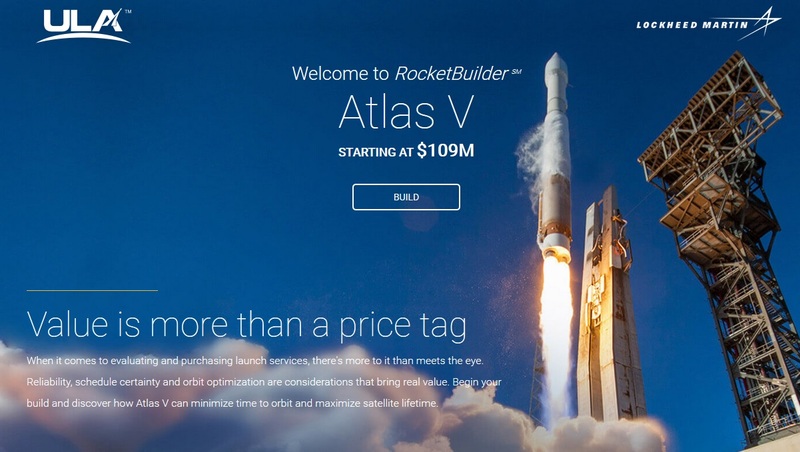 RocketBuilder shows prices for Atlas V starting at $109 million for the basic 401 version with the core package of additional services. The most powerful version of Atlas V with five Solid Rocket Boosters comes at a price of $179 million when also selecting ULA’s full spectrum of services. However, these prices only apply to standard commercial launches as missions for government customers come with steeper prices due to additional requirements for mission assurance, payload processing and in some cases classification. While unveiling the RocketBuilder, Tory Bruno also emphasized the successful reduction of Atlas V launch cost from $191 million just a few years ago to a starting price of $109 million. This was possible by streamlining the Atlas V production line at ULA’s Decatur, Alabama facility – cutting the production time of the vehicle in half. Also, as Atlas V matured as a launch system, the on-pad processing campaign was shortened by pre-integrating components and eliminating costly pre-launch tests such as the Wet Dress Rehearsal that used to be a part of every launch flow in the past and is now only performed for missions with constrained launch windows. 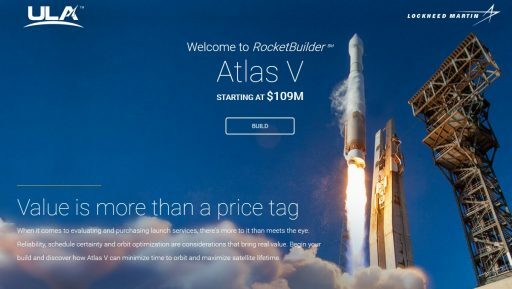 In addition to providing launch prices for all Atlas V versions, RocketBuilder has been configured to highlight value items ULA has emphasized in company advertising, specifically launch vehicle reliability and schedule certainty which can be important cost factors in a satellite project. Selecting Atlas V – still with a 100% success rate from its customer perspective – can save satellite operators upwards of $10 million in launch insurance compared to the average insurance rate across the market. Another point that could lead to significant savings is ULA’s schedule certainty with an average delay of only two weeks on Atlas V compared to three to six months on other service providers. Getting a customer’s satellite into orbit on time will avoid ground storage costs for the satellite and cut a potential loss of revenue that can be as high as $24 million, ULA says. Furthermore, orbit optimization capabilities provided by Atlas V could extend a satellite’s life by two years or more, driving up the revenue generated by the satellite by $30 million. “Comparing not only the cost of a mission, but the important value items such as schedule certainty is critical for customers, especially our commercial customers,” said Bruno. 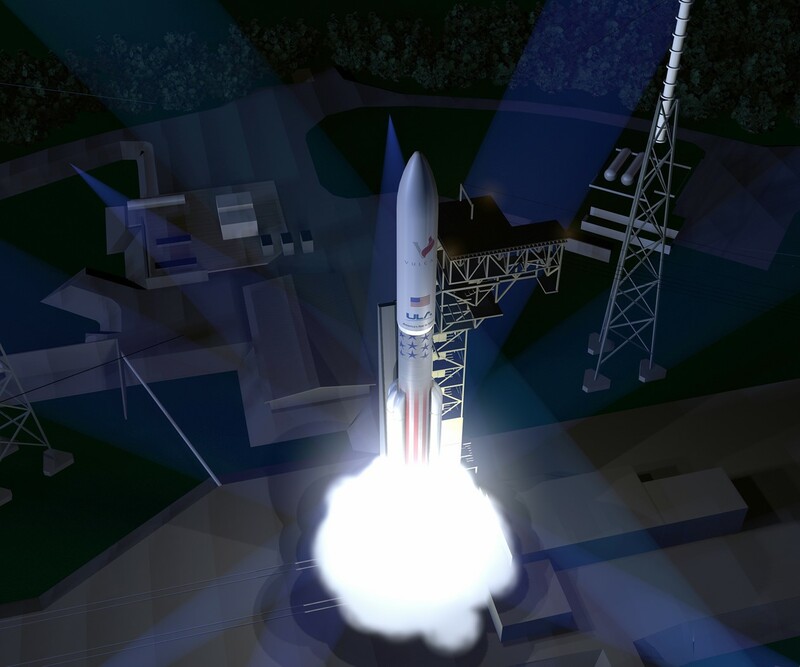 RocketBuilder is currently only available for the Atlas V rocket, though ULA will add their future Vulcan rocket to the tool next year as its development progresses toward a first flight before the end of the decade. Delta IV will not be added to RocketBuilder since the single-stick versions of the rocket are approaching retirement and all remaining Delta IV Heavy rockets have been assigned to payloads flying until the early 2020s. 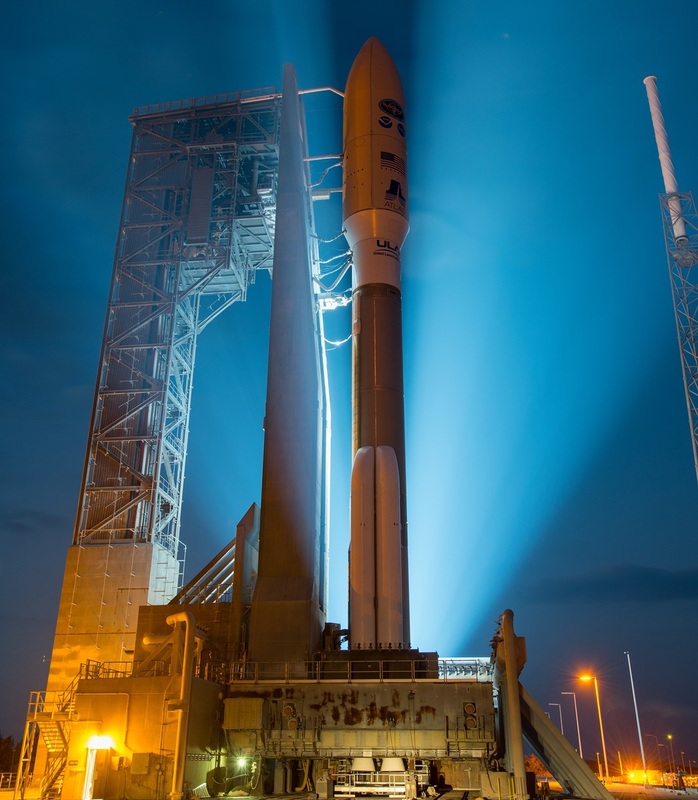 Earlier this year, United Launch Alliance announced the RapidLaunch initiative that offers a mission integration time of only three months from the selection of Atlas V to the launch of satellites that have flown with ULA before. RapidLaunch is made possible by a different approach to manufacturing rockets – building all vehicles as generically as possible with modification based on a specific mission’s needs only occurring in the last three months of the production process. ULA is in direct competition with launch services provider SpaceX that offers its Falcon 9 rocket starting at $62 million with a clear advantage in the launch prices department. 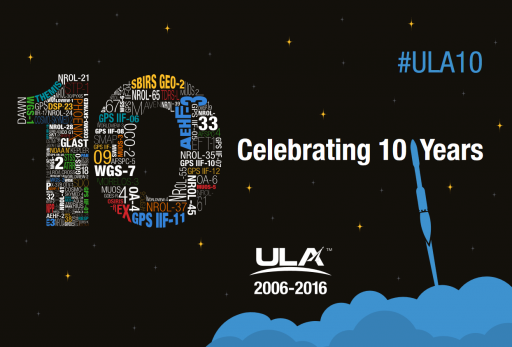 However, through its latest initiative, ULA aims to showcase the company’s advantages via providing a ‘true total launch cost’ taking into account lower insurance rates and benefits of orbit optimization and launch schedule certainty. Especially schedule certainty has been a struggle for SpaceX as the company was slowed down twice by mishaps involving the Falcon 9 rocket, backing up an already busy manifest of missions. ULA’s RocketBuilder announcement came just one day before the company’s tenth anniversary, born in December 2006 as a partnership between Boeing’s family of Delta rockets and Lockheed Martin’s Atlas V. Over its ten-year history, ULA kept an impeccable safety record over 113 missions – 71 national security missions, 28 flights for NASA and 14 commercial launches. With a changing launch market, ULA embarked on a long path of transformation in 2014 and presented the new Vulcan Centaur launch system in 2015 as the innovative and cost-effective launch system of the future, also driving forward ambitions with the Advanced Cryogenic Evolved Stage (ACES) reusable upper stage. Vulcan is conceptualized as a replacement for the Delta and Atlas V rockets covering the entire spectrum up to heavy-lift missions currently flown by the Delta IV Heavy. In the near-term, ULA looks forward to the first crewed mission of the Atlas V with Boeing’s Starliner spacecraft, currently expected in the November 2018 time frame.